According to a May 2016 report, approximately 500 juvenile lifers are in the Pennsylvania State Prison System. This is unacceptable to have our children confined in state prisons for life without the possibility of parole. Remember, a juvenile is a child. A child’s mind is still developing. We live in a violent cultural society where our children are exposed to violence daily. This should be declared a “state of emergency.” It can also be constituted as a mental health crisis. The U.S. Supreme Court decided that mandatory life-without parole sentences were unconstitutional for those younger than 18. Back in January 2012, the court ruled that the ban must be applied retroactively, to people like Marlo X Clark. This resulted in the Pennsylvania’s high courts vacating dozens of life sentences. It is evident now that Marlo X along with other juvenile lifers across the state, 300 of them from Philadelphia, will receive new sentencing hearings following the Supreme Court’s ruling in Montgomery v. Louisiana. This is a complicated process because it will have to be determined “What sentencing law applies?” Sadly, no one can really answer this question, as stated by State Sen. Stewart Greenleaf, a Montgomery County Republican who chairs the Judiciary Committee. “Nobody has any real answer,” he noted. He goes on to say, “We’re in uncharted territory here,” adding, “because we have a situation where the law these juveniles have been sentenced under has now been found to be unconstitutional, and the laws that we adopted as a legislature were adopted after they were sentenced originally” and do not apply to them. According to a Philly.com writer, Samantha Melamed “after the 2012 decision in Miller v. Alabama, Pennsylvania enacted new sentences for juvenile killers: 25 years to life for those younger than 15, and 35 to life for those 15 to 17. But that law excluded anyone whose sentence was final before the Miller decision. Greenleaf said there’s no changing that. ‘The problem is, even if we pass something, it would be ex post facto,’ or retroactive, he said. “I don’t think the legislature can do anything at this point, because it could be unconstitutional what we do,” she wrote. In another place, the Bible address those who are “bond.” Hebrews 13:3, “Remember them that are in bonds, as bound with them; and them which suffer adversity, as being yourselves also in the body.” The NOI Prison Reform Ministry advocate for the release of all juvenile lifers who are “reformable.” No child should be incarcerated in a prison. NOI Student National Prison Reform Minister Abdullah Muhammad calls for all supporters to donate to the NOI Prison Reform Ministry towards the purchasing of property to be converted into a “Transitional House,” to help address the needs of all prisoners returning to society and their perspective communities. Just get a Final Call newspaper and go to page 25 for donation information. We look forward to receiving two juvenile lifers who are registered with the National NOI Prison Reform Ministry Office; namely, Brother Marlo X Clark incarcerated at SCI-Coal Township, Pennsylvania and Brother Charles X Dickerson incarcerated at SCIChester, Pennsylvania. Support your NOI Prison Reform Ministry. 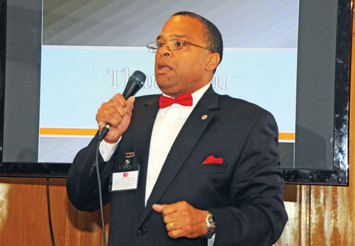 Gregory Muhammad is Student Regional Prison Reform Minister for the Delaware Valley.